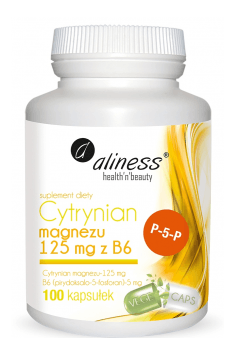 Aliness Magnesium Citrate with B6 is a dietary supplement that provides magnesium and vitamin B6 in an active and highly absorbable form. Both of these components are necessary for the proper functioning of the body. It is also noteworthy that apart from the active ingredients, capsules contain only the glazing substance. This means that there are no unnecessary fillers or coloring agents. Magnesium citrate is an organic salt composed of citric acid anhydride and magnesium. Citric acid is a compound commonly found in cells and it plays an important role in the Krebs cycle (also called the citric acid cycle). This process is an important component in the energy production occurring in the cell mitochondria because it is when ATP is created – a chemical energy carrier. The solubility of organic salts in water is very high, thanks to which magnesium is released in the form of ions and can be easily absorbed by the body's cells. Magnesium is the second most important intracellular cation, right after potassium. It plays an important role in the formation of ATP because it activates the enzymes responsible for phosphorylation reactions. It also participates in the regulation of the cellular cycle. In addition, it is a component of transport proteins of the respiratory chain necessary to obtain energy (NADH2, NADPH2, FAD, and CoA). Magnesium helps in maintaining the electrolyte balance, shows a cardioprotective effect and reacts with phospholipids thus creating cell membranes. Magnesium also co-creates ribosomes – intracellular structures responsible for the translation process, i.e. protein formation. Thanks to this, magnesium supports the expansion and proper functioning of muscles. Macroscopically-wise, magnesium protects the heart from hypoxia and the blood vessels from excess calcium, which ensures their flexibility. It is also necessary for the synthesis, storage and release of certain hormones and is an important building block of teeth and bones. It also contributes to the reduction of tiredness and fatigue and improves the functioning of the nervous system. Magnesium preparations are recommended not only to people exposed to severe stress, tired and irritable, but also those who struggle with muscle cramps, increased risk of atherosclerosis or electrolyte disturbances. Another component of the capsule is the active form of vitamin B6, i.e. pyridoxal-5-phosphate (P-5-P). It is the component of many enzymes that participate, among others, in the synthesis of tryptophan, catecholamines, serotonin and hemoglobin, and in the metabolism of fats, proteins, and carbohydrates. The combination of magnesium and vitamin B6 in one preparation increases magnesium absorption in the intestines and accelerates its transport to cells, which is why this supplement is so effective. Vitamin B6 (pyridoxine) has a protective effect on the skin. Deficiencies of this vitamin may cause seborrhea, discoloration, and eczema. In addition, pyridoxine participates in the biosynthesis of sphingosine, neurotransmitters, DNA, and porphyrins; it takes part in the proper division of cells, in the reduction of fatigue and contributes to the maintenance of normal psychological functions. Vitamin B6 also helps in maintaining proper homocysteine ​​metabolism and improves the functioning of the immune system. Demand for vitamin B6 increases in pregnancy and during periods of a high-protein diet. In summary, Aliness Citrate Magnesium with B6 is an ideal dietary supplement not only for people complaining of chronic fatigue, muscle pain or irritability but also for anyone who wants to ensure their body with a supply of adequate amounts of micronutrients. A large package is enough for up to 3 months of use. Citrate Magnesium 125mg with B6 100 caps. Take 1 or 2 capsules a day; preferably with food. Latest research prove that magnesium is best absorbed with food, therefore, it is best to combine the supplement with a meal. Iron, calcium and phosphates are the limiting factors of the magnesium absorption. If you are supplementing one of these ingredients and you want to maximize the absorption of them all, divide their dosage within the whole day, with the maximum possible intervals in between. In addition, phosphates are often present in food as preservatives, so you should read the labels and avoid such meals during magnesium supplementation.